NEIU student alleges employees and campus police officers harassed and discriminated against him based on his race, physical and mental abilities based on a lawsuit filed in July of 2018. The litigation, Jackson v. Northeastern Illinois University, complaint states the NEIU student, Curtis K. Jackson Sr., suffers from a variety of disabilities: bipolar disorder; cluster migraine headaches; chronic allergic rhinitis and sinusitis; bilateral torn ligaments; osteoarthritis in his knees; a dislocated left shoulder; hypertension; sleep apnea and morbid obesity. In July 2017, Jackson fell in the Physical Education Building (PEB)’s main shower due to an uneven and wet floor and sustained injuries due to the fall that left his face swollen and unable to eat or communicate. These injuries resulted in a trip to Cook County Hospital’s emergency room, where the emergency room doctors, according to the complaint, diagnosed him with Bell’s Palsy. Due to this, he requested accommodations from the PEB staff to use the PEB facilities in a safer way. These accommodations including receiving extra towels to walk on while in the shower, locker room, steam room and the use of the handicap accessible door at the main entrance. 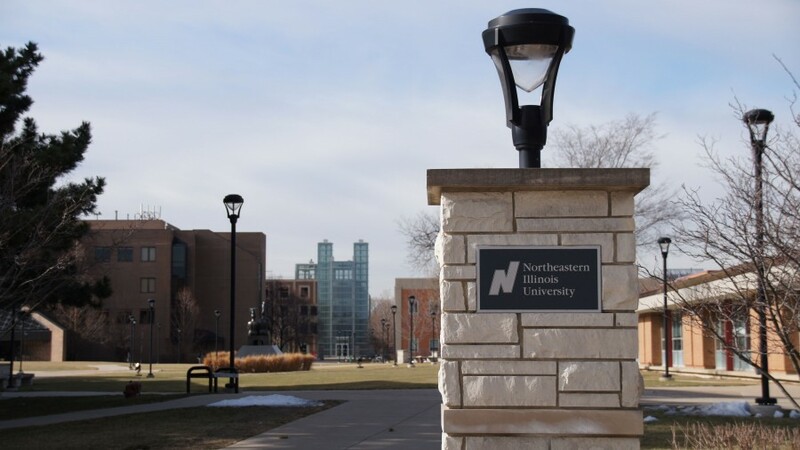 According to the complaint, after receiving the accommodations, he began experiencing harassment from the PEB staff, student workers and NEIU police officers. The initial complaint named 15 different NEIU employees but has since been dropped to the following defendants: Northeastern Illinois University; Director of Campus Recreation, David W. Merrill; NEIU Police Officer, Pablo F. Castro; and NEIU Police Officer, Arturo Galindo Jr.
Case: 1:18-cv-04831. Document #: 24; Filed 11/08/18. Page 9 of 16. PageID#: 170. Northeastern Illinois University, Galindo Jr., Castro and Merrill are all being represented by Husch Blackwell LLP. Jackson is being represented by Shaw Legal Services, Ltd.
Jackson is a senior at NEIU, majoring in inner city studies, minoring in social justice, has a 3.55 GPA and has 12 credit hours left to graduate with a bachelor’s degree. The next status hearing for Jackson V. Northeastern Illinois University is set for Feb. 6 at 9 a.m. The Independent will continue to follow and report on this event. In July 2018, NEIU student Curtis K. Jackson Sr. filed a civil rights complaint against NEIU and more than 12 employees on the Americans with Disabilities Act (ADA) violations. As reported by the Independent on Jan. 22, several of the defendants were dropped from the suit, leaving only three. Currently, there are no updates on the case. There have been several documents filed with the Illinois legal system requesting more time. The next status hearing has been reset for March 12, 2019 at 9 a.m. The Independent will continue to keep the community up-to-date on this issue. For more information about the lawsuit, please read the Jan. 22 article. I hope some people get fired over this. I have a vision impairment and other health concerns. I am not sure I want to sign up for a staff recreation pass now and pay for the privilege to be harassed. No surprise about racism from police. That’s the America we must rebel and fight against every day. This is shameful, and I don’t understand something like this happening at a school that wants to target african-ametican high school seniors for future attendance. My grandchild attends this school and has a social anxiety disorder, and I told her to stay away from this physical education building. She can go to the local ymca, I’d pay for it. My grand daughter attends this school, and she has an social anxiety disorder, but; after reading this article and the court record, I think this is just shameful. Now, can see why she wants to transfer, I had no idea. And that officer: “Not Interested”. So, I guess his new boss brought the CPD way of doing things with him. I have lived in the area (North Mayfair) close to Northeastern Illinois University for more than 8 years, so; after reading this article, I found myself feeling so disappointed. I know that this is a situation to be contested in a court of law, but, given this school’s history with lawsuits filed by students in the past, and researching the demographic makeup of it’s campus police dept. and physical ed. dept., maybe this situation should not be all that surprising. Good luck with the “diversity” pitch to black students from Chicago Public Schools. Ms./Mrs. Mary Thomas comments have merit.